Inspired by the mounds of wind-pruned plants in the surrounding countryside, De Vésian clipped shrubs into organic forms to mimic the curved forms of the hills and trees. Other plants were chosen for their naturally rounded form or were left unpruned in exuberant contrast to their clipped neighbours. 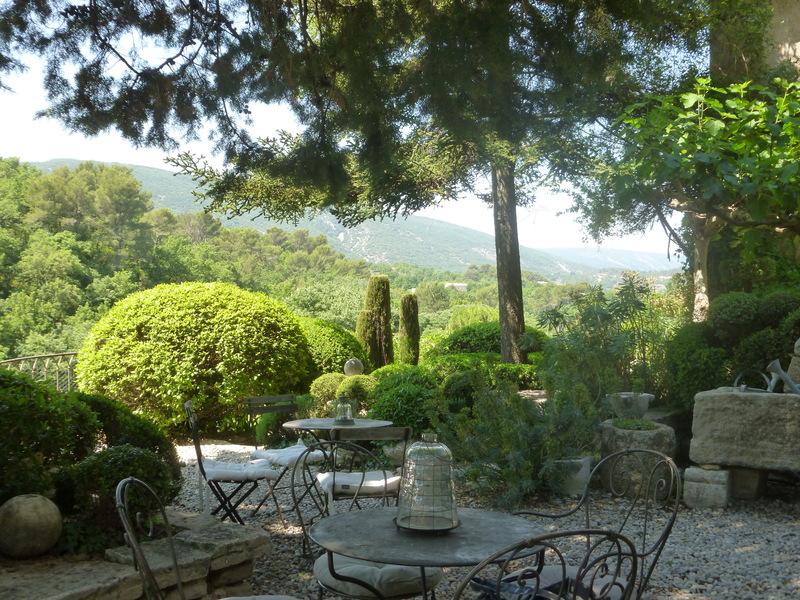 The garden belongs to the Provençal landscape and the boundaries between garrigue and garden are blurred, the same plants being found both within and without the garden. Pinus pinea, arbutus, cupressus, Pistacia lenticus, cistus, rosemary and lavender; these are locally-found shrubs and trees which survive the drought, extreme temperatures and mistral winds common to this part of France. The old stone water tank, built many years ago to collect rainwater for the irrigation of olive trees, has been made into a small plunge pool. Steps descend to the lowest of the three terraces, the gaps in the broken stone have been colonised by cetranthus and thyme. On the lowest terrace a lavender parterre is planted in rows. 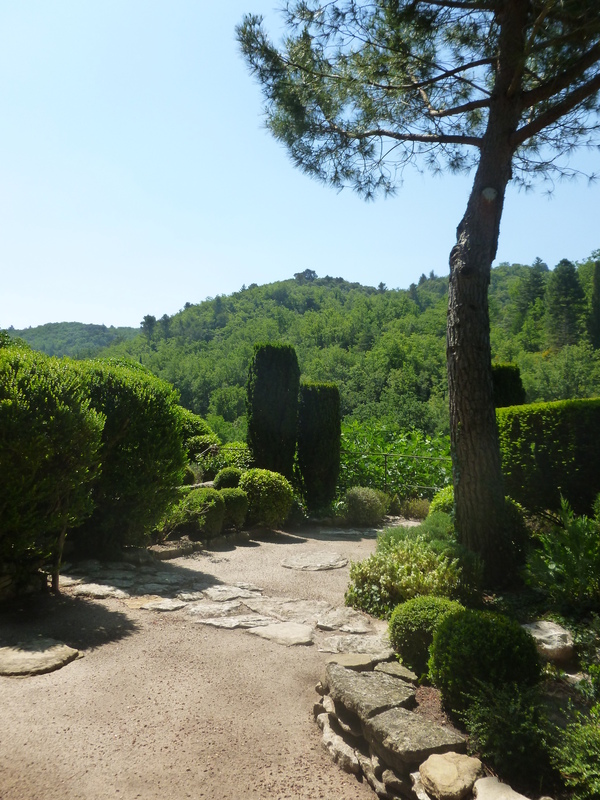 A stone seat with views of the garrigue woodland is flanked by four clipped cypress trees. Legend has it that the trees were languishing in a nursery with their tops broken and that De Vésian decided to just buy them at a discount and just clip them horizontally. Their strong silhouettes are brought into relief by the soft shapes of the woodland trees beyond and mirrored by the spires of naturally occurring cypresses. The twisted trunk of this arbutus tree, pruned by the artist Marc Nucera, brings a living sculpture to the upper terrace. This garden, though firmly rooted into the landscape remains, in my view, decidedly French. 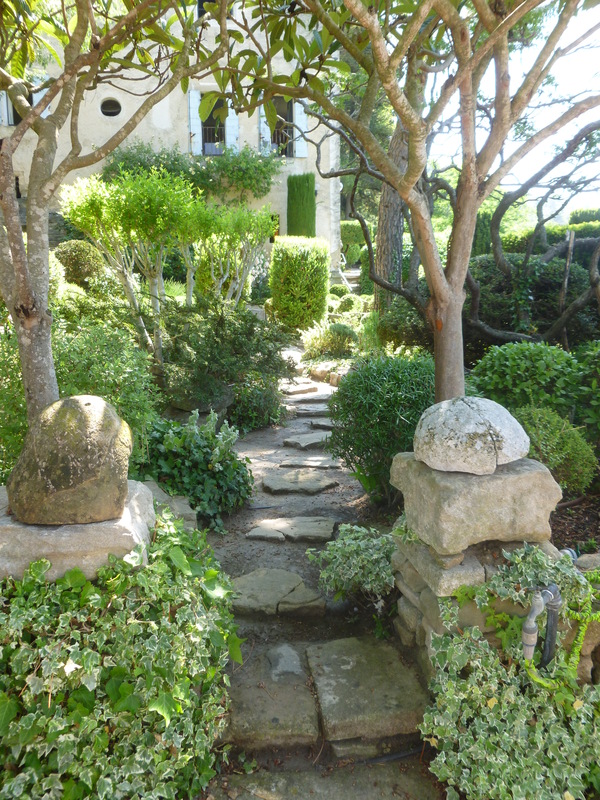 The lavender parterre, the use of symmetry and a desire to control nature are all to be found here, but like the Jardin Plume, this is done with the lighter touch and preoccupations of today’s gardeners, being at the same time respectful of nature and the surrounding landscape, without a sense of pomposity or grandeur. 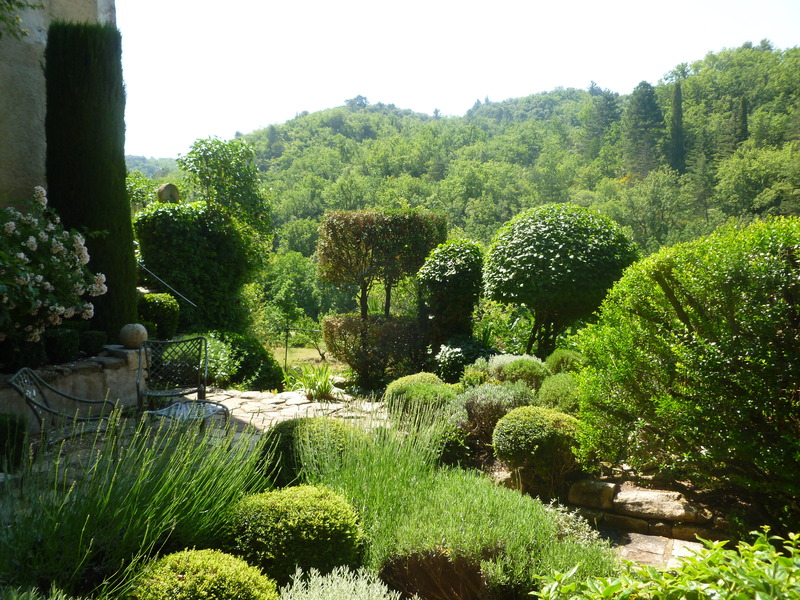 Here the essence of the Luberon hills is exaggerated, bringing a heightened sense of the natural beauty of the surrounding landscape into the garden. I visited the garden and took these pictures in June 2015 while I was assisting on a tour organised by French Gardens Today. 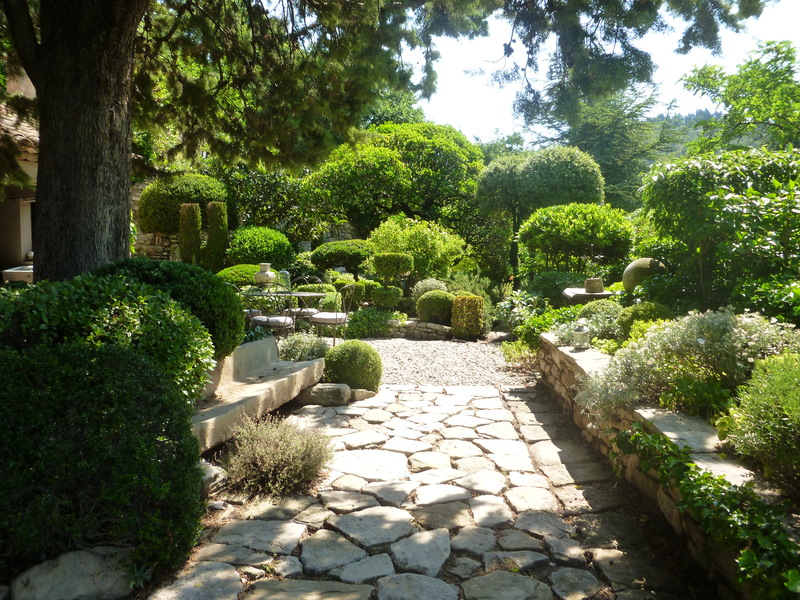 The garden is open to groups on Thursday afternoons during the summer but you need to reserve a place in advance either through the Office de Tourisme in Bonnieux 04 90 75 91 90 or by emailing pascalverger@me.com. Admission in 2015 was 11€ per person. Bonnieux is a beautiful medieval hilltop town and there are some charming cafés, restaurants and shops. The garrigue oak honey I found in one of the shops on the main street was particularly good. Wikipedia page for the garden in English. NB : I’m quite shocked that I’ve not posted anything for 8 months. My design business is taking off and I’ve been particularly busy and so this blog has been neglected. However, I hope to post again very soon. Certainly on my garden list. Maybe summer of 2017. Hi James, This garden is really worth a visit. It’s an interesting mix of the use of native plants in a beautiful natural setting, but with plants that are very controlled and clipped. It’s French with a strong Japanese influence. I certainly hope you get to see it this year. Before I get to France, I may be asking for your advice, Lynda. Glad to hear you’re so busy you don’t have time to blog. Please don’t hesitate to ask! It would be a pleasure.